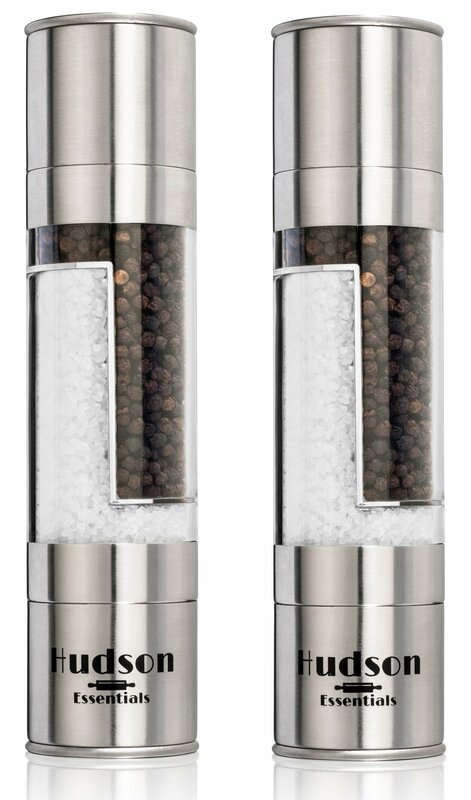 Home › Home and Kitchen › Hudson Deluxe 2 In 1 Salt And Pepper Grinder Set - Ceramic Blade & Stainless ..
Hudson Deluxe 2 In 1 Salt And Pepper Grinder Set - Ceramic Blade & Stainless ..
FRESH SEASONING WITH JUST A TWIST Just turn the pepper mill or salt grinder end to grind fresh spices right onto your plate! It's never been easier to enjoy the full flavor of salt and pepper! THE PERFECT COARSE OR FINE GRIND Our premium ceramic pepper grinder mechanism creates an even grind without sticking. You can adjust the salt & pepper mill for a coarse or fine grind to suit your taste or your recipe. Grind all your favorite spices with your second 2 in 1 grinder or simply keep one dual mill in the kitchen and the 2nd one in the dining room. SIMPLIFY SEASONING Clear acrylic viewing window lets you easily tell the spices apart inside of the salt & pepper grinder, so you'll never shake the wrong thing onto your food! Plus, the viewing window makes it easy to see when it's time to fill, making it much easier to use than an all-metal salt & pepper set. SAVE MONEY & SPACE Instead of buying a 2-piece salt & pepper grinder set, get a combo salt and pepper grinder! It costs less, and it gives you more room in your cabinets than separate salt and pepper grinders. And you get 2 Dual Mills to use for all your spices. MADE FOR DAILY USE Other salt & pepper grinder set mills just don't last like ours! Even if you use your salt and pepper grinder set every day, you can count on ours to stand the test of time due to its heavy-duty stainless steel and ceramic construction. Hudson Deluxe 2 in 1 Salt and Pepper Grinder (Set of 2) Ever notice that when you go to a restaurant and the waiter grinds the pepperright onto your salad how good it tastes? Salt and pepper shaken out of yourordinary salt & pepper set just isn't the same, but it is possible enjoy thefull flavor of black pepper and sea salt right at your dining room table. The Hudson Essentials 2 in 1 Salt and Pepper Grinder Set gives you a premiumpepper grinder and salt grinder in one handy gadget. Just add your whole blackpepper to one side and your sea salt or Himalayan salt to the other. The widemouth on the salt & pepper mill makes filling easy, and you can tell which wayto turn the salt & pepper grinder with just a glance. When you're ready to add a little seasoning to your cooking or your finisheddish, just remove the stainless steel freshness cap from the correct end andtwist, Our heavy duty precision engineered ceramic salt and pepper grindermechanism does the rest, grinding the spice before it's dispensed onto yourfood. It couldn't be easier! Whether you like coarsely or lightly ground seasoning, the Hudson Essentials 2in 1 Salt and Pepper Grinder Set is perfect for you. The salt & pepper mill isfully adjustable, so you'll get the perfect grind every time. Unlike anordinary wooden pepper mill, our ceramic salt and pepper grinders turnsmoothly without getting stuck. The Hudson Essentials 2 in 1 Salt and Pepper Grinder Set will look handsome onyour table with its gleaming stainless steel ends and sleek, modern design.The metal components will never tarnish or develop rust, and the acrylicviewing window won't crack or shatter like glass. Don't settle for anything less than the delicious taste of fresh seasoningright from your very own salt & pepper grinder.